“Conked” on the Head . . . I begin my week days with a walk that varies somewhere within the boundaries of the West Village. This morning constitutional gets me out and about into the fresh air where I can contemplate the city’s waking and seek out nature’s flora and fauna before the bustle of daily human business become too much to bear. When relaxed I find my walks are much more in the moment and in my present place. Bright and busy days often keep me indoors and, if I do go out, often in my mind’s eye. There I can ruminate over my current first thought and get on with little distraction or pause to where I’m going. Gray days provide a contrast, often in the form of fewer people, which gets me out and about in a much more slow and engaging way. At these times I look and listen much more carefully, a state of being which is much more open to outdoor discovery. A thin March rain was adding a shine to all the surfaces, even the street, which helped to temper the sound of passing traffic. A car or truck sounds much more pleasant on wet blacktop, like a rolling wave rather than a rattling trap, and the lighter touch of this watery sound relaxed me as I started up eastward along West 13th Street. I was looking about, appreciating red brick and brownstone homes lining the blocks between 7th and 5th Avenues. The smooth gray branches of red maples were beginning to be lined with fresh color, revealing why this species is nicknamed redbud. The taller black locust trees remained dark and bare, colored only on the northern face of their thickly rippled trunks. Now tinted in places by a sheen of bright green, the locusts were playing host to crustose lichens, taking advantage of the perpetual damp fed by the recent persistent rain. The crustose lichen, so named for its thin surface appearance, is an interesting character in its own right: a composite creature – half fungus, half alga, living in symbiotic balance – that in part foreshadowed my first newsworthy wild plant encounter. This one was accompanied by the soothing call of mourning doves perched high in the branches above. Below them, and to my right side, were the townhouse front gardens – one of the best benefits of a residential block that has retained a nineteenth century character. Most of these small plots remained true to the March season, consisting of brown damp soil, evergreen yew or holly hedges in need of a shave, and the scattered pale green thumbs of eager crocus and daffodil. Not one but two varieties of this common member of the phylum Basidiomycota clung to this stump. One consisted of a tightly layered colony of white, flaky, horizontal ridges ( Trametes ) while the other grew singularly in broad, fleshy, rust-colored brackets ( Ganoderma ), which were spaced like detached houses. Brackets are also called shelves or conks. Both varieties I found have a cosmopolitan distribution. Despite its superficial meaning, the phrase does not mean these plants are specifically city dwellers, or sophisticates. Instead, the term is actually derived from biogeography and refers to an organism (like cats, dogs, and humanity itself) that is found – distributed – throughout the world. One can read the age of a fallen tree by reading its rings. Tree stumps, like the one I found on West 13th Street, give a patient counter a clear view. Ironically, the age of bracket fungi can be read in a similar way. Conks acquire a ring of new growth each year. As the shelf area expands, rings form in an expanding pattern of alternating convex and concave ripples, like a fingernail, along the surface. 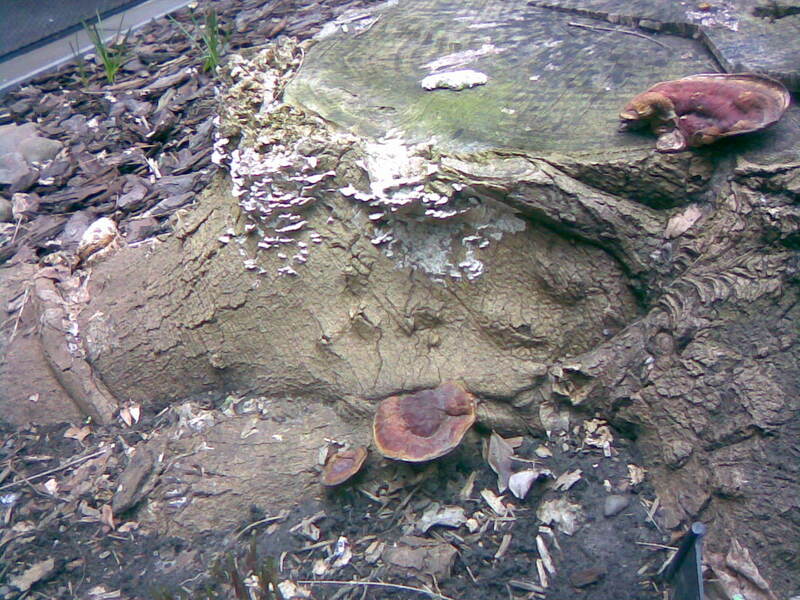 The Ganoderma pictured here appear to be between two and four years of age. Almost everyone has encountered such fungi growing in the deadfall along park trails or on an old stump in a neglected corner of the backyard. Finding living examples beside the stoop of a tidy West Village townhouse is not so common, however. Considering how suddenly and unexpectedly this mycological spectacle appeared to my eye, I could say I was in a way conked on the head, in the West Village, literally as well as figuratively. The extended bracket fungi family has several notable members. One is the Artist’s Conk ( Ganoderma applanatum ). The bracket of this variety has long been used by artists as a canvas for etching and drawing, as its pale undersurface turns dark when scratched, perfect for holding a line. One of my grandmothers has just such an example, one that depicts a country carnival scene, displayed in her China closet. When referring to China, one cannot overlook Ganoderma lucidum, a bracket fungi also known as the Lingzhi mushroom. This variety, which strongly resembles the larger of the two West Village examples, has been a staple of Chinese medicine for several thousand years. The brackets are sliced and boiled into a tea used as an antiviral agent in immunotherapy. I find it fitting that one of the first wild plants I encountered this season was not a flower at all, yet its presence bloomed in my eyes and opened up an entire new phyla for my urban botanical consideration. The unique color and appearance of the bracket fungi in the city stands out, like a single dandelion in a green law, or any other wildflower in the West Village.